Volume mousse. Hydration, style and shine. With active vegetable mother cells, ceramides and pure keratin. 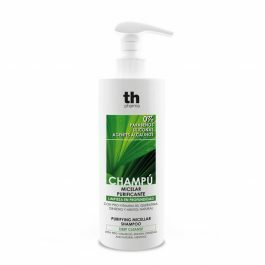 Holds style, hydrates and replenishes hair, with flexible hold. Apply the required amount to clean damp hair, according to length and thickness. Distribute evenly from roots to ends and style as normal. Purifying micellar shampoo. 400ml. Th Pharma. pH 5.5 / Frequent use. Deep cleanse. 0% parabens 0% silicones. Non-alkaline. With Pro-Vitamin B5, Keratin, Ginseng and natural Menthol. 2 phase school spray conditioner. Prevent. Petit. With Tea Tree Oil, Lemon extract and Dimeticone. Formulated to hydrate, protect and de-tangle. Dermatological studies confirm the effectiveness of tea tree oil to prevent head lice. Dimeticone forms a protective coat over the hair.